In 1866, the Corinth National Cemetery was established in Corinth, Mississippi, as a final resting place for 5,700 Union soldiers who died in the capture and occupation of Corinth, and in other engagements in Mississippi, Alabama, and Tennessee. During the Civil War, Corinth’s strategic importance as a railroad junction brought Union and Confederate forces to battle over control of the northeast Mississippi town. In 1854, the citizens of Tishomingo County invited two rail companies, the Mobile & Ohio and the Memphis & Charleston, to build lines through the largely agricultural area. Within a year, the companies completed their surveys, and their two routes intersected in the north-central Tishomingo County. A small town grew up at the crossroads of the two new railroad lines, originally called Cross City. By 1855, the rapidly growing town changed its name to Corinth after the crossroads city of ancient Greece. Because it was at the junction of two major rail lines, both Confederate and Union strategists recognized the importance of controlling Corinth. The town was at the crux of two significant engagements, a siege of the town in spring 1862 and a bloody conflict in the fall of the same year. In April 1862, Union forces began a slow march from their camps in Tennessee to Corinth. Under the command of Major General Henry Halleck, a force of 125,000 Union troops made its way south through rugged country, taking one month to travel 22 miles. When Union forces were 10 miles from Corinth, the cautious Halleck adopted an elaborate procedure to protect his troops. The troops dug trenches along their approach at intervals of one mile, creating a series of defensive fall-back points. Eventually a series of seven defensive lines were created with 40 miles of trenches. Protected by newly constructed earthworks, Confederate forces at Corinth waited for Halleck’s approach. The siege of Corinth began on May 25 when Union troops came within range of the earthworks and started shelling the fortifications and railroad facilities. Union forces outnumbered the Confederate defenses, who were under the command of General P. G. T. Beauregard, two-to-one. With his men suffering from poor water supplies, typhoid, and dysentery, Beauregard knew that he could not hold Corinth. In order to avoid a potentially disastrous fight, Beauregard devised an elaborate hoax for the retreat. By secretly shipping troops and supplies out on the Mobile & Ohio Railroad, Beauregard convinced Union forces that he was preparing for an attack. When Union forces entered Corinth on May 30, they found a deserted town. Union troops took over the town, ending the four-day siege. Once in Corinth, Union General Halleck ordered the construction of additional fortifications, including a series of cannon batteries. Halleck’s successor, Major General William Rosencrans, added additional batteries and trenches in preparation for an anticipated Confederate assault on Corinth. On October 3, 1862, a Confederate force of more than 20,000 troops advanced on heavily fortified Corinth. For two days, the forces clashed in what would become one of the bloodiest engagements of the war. In the end, the Union held control of Corinth, repelling the attacks and sending the Confederate forces into retreat. Union casualties totaled 2,360, while the Confederacy’s were more than 4,800. The Union continued to occupy Corinth through January 1864, using the town as a base for reconnaissance and raids into Mississippi, Alabama, and Tennessee. After the Union troops pulled out, Confederate troops reoccupied the town, but the Southern war effort was rapidly disintegrating and had become too weak to use the railroads for strategic advantage. Because of the casualties from the battles and other conflicts in the region, a national cemetery was established on a two-acre portion of the battlefield in 1866. The first interments were gathered from a dozen sites throughout northern Mississippi, Alabama, and southern Tennessee. By 1870, the cemetery contained 5,688 interments, including almost 4,000 unknown Union dead. 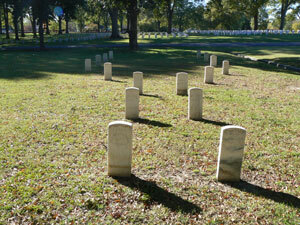 Three Confederate burials are in the cemetery, including one unknown and two known soldiers. 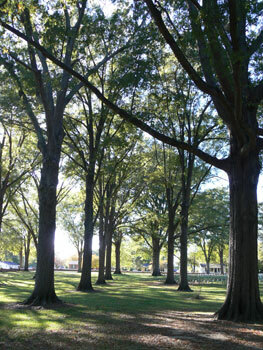 Corinth National Cemetery’s layout is a square in shape, bisected by a central avenue running from the southern main gate to a rear gate on the north end of the property. 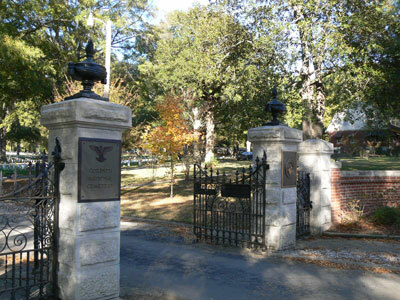 Double gates at both the northern and southern entrances are of ornamental wrought iron supported by granite piers and flanked by narrower pedestrian gates. At the north end of the cemetery, the central avenue splits around a grassy circle on which the cemetery’s flagpole is located. A series of parallel avenues running east-west further divide the cemetery into smaller burial sections. A brick wall constructed in 1878 to replace a wooden picket fence encloses the cemetery. The superintendent’s lodge is located in the southeastern corner of the cemetery. Built in 1934, the two-story lodge features a gambrel roof with shed dormers evocative of the Dutch Colonial style popular at the time. The 1934 lodge replaced an earlier 1871 Second Empire-style lodge. East of the lodge is a simple brick maintenance building containing storage space and public restrooms. Corinth National Cemetery is located at 1551 Horton St. in Corinth, MS. The cemetery is open for visitation daily from 8:00am to sunset; however, no cemetery staff is present on site. The administrative office is located at the Memphis National Cemetery in Memphis, TN, and is open Monday-Friday from 8:00am to 4:30pm; it is closed on all Federal holidays except for Memorial Day and Veterans Day. For more information, please contact the cemetery offices at 901-386-8311, or see the Department of Veterans Affairs website. While visiting, be mindful that our national cemeteries are hallowed ground and be respectful to all of our nation’s fallen soldiers and their families. Additional cemetery policies may be posted on site. Corinth National Cemetery and other sites associated with the Battle of Corinth are a National Historic Landmark. The Corinth Civil War Interpretive Center is operated by the National Park Service as a part of Shiloh National Military Park. The center, a half-hour drive from the Shiloh Battlefield, interprets the key role of Corinth in the Civil War’s western theater. The center is located near the site of Battery Robinett, a Union fortification that witnessed some of the bloodiest fighting of the Civil War. The 1862 conflicts at Corinth are featured in an online lesson plan, The Siege and Battle of Corinth: A New Kind of War. The lesson plan is produced by the National Park Service’s Teaching with Historic Places program, which offers a series of online classroom-ready lesson plans on registered historic places. To learn more, visit the Teaching with Historic Places home page. Corinth National Cemetery was photographed to the standards established by the National Park Service’s Historic American Landscapes Survey.